4 core + 4 GB should be fine. Maybe there is something wrong with your openstack setup? Can you try using kvm (method 2) to launch the backend VM? i will try and give you feedback on a couple of hours max. 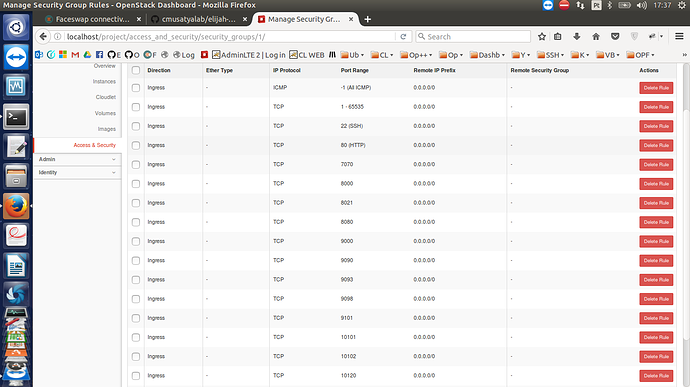 If you were using OpenStack, each VM in OpenStack is bound to a security group. You may have exposed a few of the ports that Gabriel needs for communicating various streams in that security group, but not all of them. Under Compute -> Access & Security, click the button the Manage Rules for the security group that your VM is using and ensure that there are ingress rules to allow the traffic from the client to get to the VM. I hope that can help us to determine where is the problem. I don't see anything glaring in the images you posted. I think it would be beneficial to try Junjue's suggestion of removing OpenStack from the equation. Can you use the following guide, https://cmusatyalab.github.io/faceswap/, and use method 2 to launch the VM with virsh? If we use pure KVM/QEMU then we can rule out anything going on in OpenStack (or elijah-openstack) layer. sorry but yesterday i couldn´t make the test, i will try later and come back to you with the result. after some test I am able to make trainings, choose action ad make demo with configuration of 6 VCPUs and 4 GB RAM. The test demo take a little bit before faceswap. Glad to hear you got it working. So you solved it by using 6 CPUs? I can use Faceswap indeed with 6CPUs and 4 GB RAM. The swap of the face is made with Latency of 50,30 ms and FPS of 18,42. Is that a good result comparing with AWS server? Unfortunately, at the time I do not take note of time results. Am I able to reproduce it by myself? @MSoares To compare with AWS, you should test the performance under your particular network setup. Your cloudlet number looks reasonable to me. sorry for my late reply, but I had to put a little time out due to my health. So, during that time and under the same network configuration, I launched Faceswap Server with Openstack ++ on a 6 CPUs and 4GB RAM, and the swap occurs with Latency of 50,3 ms and FPS of 18,42. In that time, I have launch AWS Faceswap Server on Ireland with m4.large (2 CPUs and 8 GB RAM) and the test result is a latency 270-360ms and FPS of nearly 3,64. What is your opinion and this result test? Do you think better to test AWS Faceswap Server on Ireland with m4.xlarge (4 CPUs and 16 GB RAM)? I do not understand clearly how I can manage and present the network transmission time and server computation time. Thanks for your understanding and estimated help guys. I am unsure if there is a way to delineate network transmission time versus the computation time on the server. Perhaps there are details in the Faceswap log on the server that distinguish where the time goes. I think that your current configuration clearly displays the benefits of edge computing. You could certainly increase the specs of the AWS instance and repeat the measurements. You will likely see some reduction in the total roundtrip latency because of reduced computation time, but I think it would still not approach the latency nor FPS of the cloudlet case. 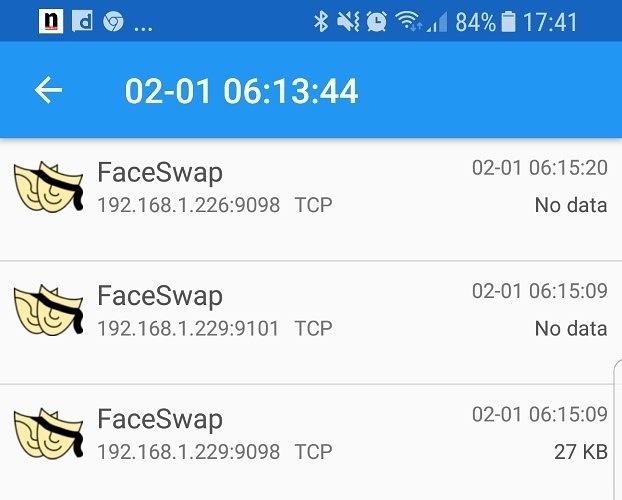 If you wished to break it down further, and the functionality doesn't already exist in the logging of Faceswap, you could probably instrument the server application to log the computation time and the client to capture the end to end latency. With these two quantities you can compute the network transmission time. My inclination is that the CPU time is somewhere on the order of 10-30ms. So in the AWS Ireland case, it would account for only about 10% of the round trip time. Obviously in the cloudlet case it has a much bigger impact if you can subtract an additional 10 or 15ms from an RTT of 50ms.